Podcasts are blasting through a popularity level we really haven’t seen since the release of the Apple iPod back in the mid-2000s. There was a time when podcasts were a very hip thing that was just on the cusp of becoming mainstream. Well, welcome to the mainstream kids: podcasts are for normies now. From the massive popularity of the investigative journalism podcast Serial to shows like the Joe Rogan Experience pulling in A-list celebrities and even politicians, podcasts have come a long way from the underground music-review-laden landscapes of 2007. 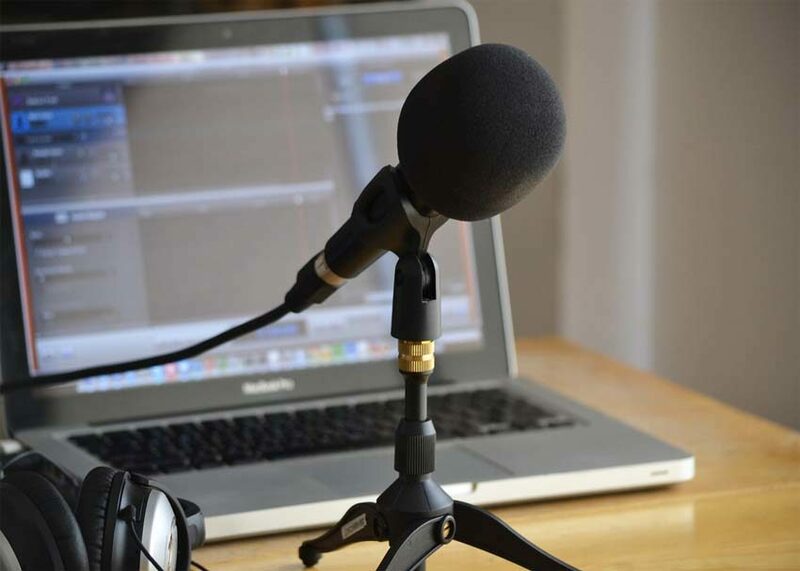 Now that the real world is knocking at podcasters’ doors, it’s a great time to learn how to create a podcast and broadcast to the world what you’re passionate about. The Poki Podcast with OfflineTV at TwitchCon 2018. 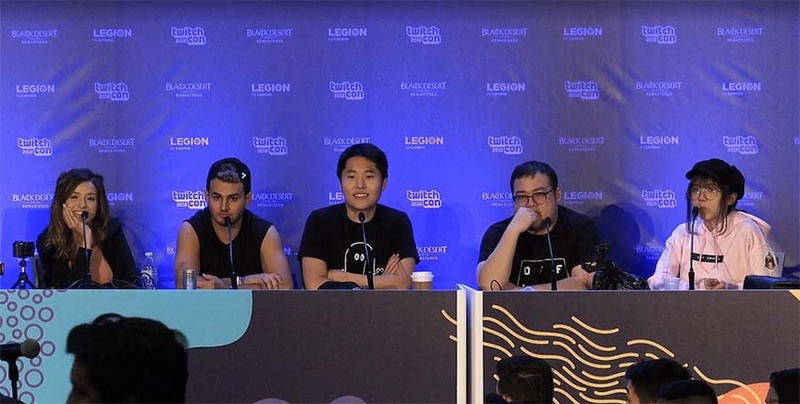 Left to right: Pokimane, Fedmyster, Disguised Toast, Scarra and LilyPichu. Image courtesy of Geralt Master. A great podcast starts with a great idea. Sure, interview podcasts are all the rage right now, but attracting A-list talent for an interview right when you’re starting out isn’t going to be easy. So to supplement for your lack of network, exploit a niche that you’re passionate about and talk about it. Some of the greatest podcasts around are a host or hosts talking about things they enjoy or have specific knowledge of. A good way to figure a theme out is to look at what you enjoy most and tear away the excess — boil that passion down to a level where you can speak directly with your audience about it for hours at a time, just like speaking with your friends. When you can picture yourself doing that, you’ll have your idea. After the idea is hatched, it’s time to think about show format. Planning a podcast is much like planning a performance. There will be scripted elements that you’ll play around in, but much of the podcast “performance” will be improvised and off-the-cuff. Let’s say you’re like me and decide to create a 30-part series with episodes profiling each NHL Entry Draft pick for any given year. In a 30 minute to an hour-long format, there’s no way I would write an entire script and stick to it. It would end up sounding too robotic and come across like I had no idea what I was talking about. Instead, I wrote down a few key bullet points about each player drafted, specific needs from the team that drafted them and then, in the moment came up with phrasing and an overall takeaway. Because I was passionate about NHL hockey, I could use prior knowledge to fill in the gaps between each bullet point. This went over well with my audience of fellow hockey nerds because it sounded like a conversation you’d have in a bar with your buddies. Now that your podcast idea and format have been nailed down, you can start thinking about gear. It’s important not to overwhelm yourself at this step; many aspiring podcasters and content creators tend to overestimate gear and skills necessary to start creating, thus leading to them never start their project. 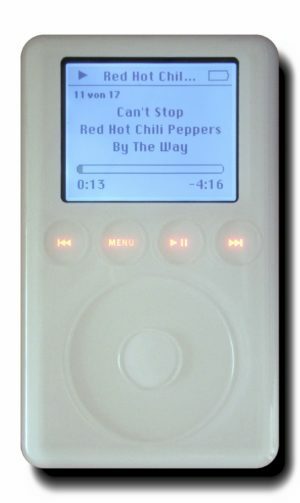 A podcast gear list in its simplest form consists of a recording apparatus and a computer connected to the internet. I know many DIY podcasters personally that record and edit entire episodes on their phones and then upload them via that same phone. With today’s technology, it’s easier than ever to instantly start creating with all the tools you need in your little black mirror. Expanding on the mobile recording workflow, the Spire Studio mobile recorder records from two XLR combo inputs over a Wi-Fi connection onto your IOS or Android recording app. This is perfect for podcasters on the go or those that need pro-level sound during a backstage interview or performance. But what if you want to take it to the next level — to be on par with the big time broadcasters like Joe Rogan, Chris Shiflett and Frasier Crane? Then you’ll need equipment and software much like engineers and producers from professional recording studios! Dynamic microphones. Left to right: Shure SM-58, Electro-Voice RE-20, and Shure SM-57. This starts with your interface. The lifeline between your computer and digital audio workstation (DAW), the interface can take many forms. There are small boxes with a couple of XLR inputs like the Focusrite 2i2, dedicated mixers like the Roland VR-1HD AV streaming mixer specifically designed for content creators, and even a standalone USB microphones like the Rode Podcaster. Once your interface-to-computer connection is established, you’ll need something to capture your vocals. 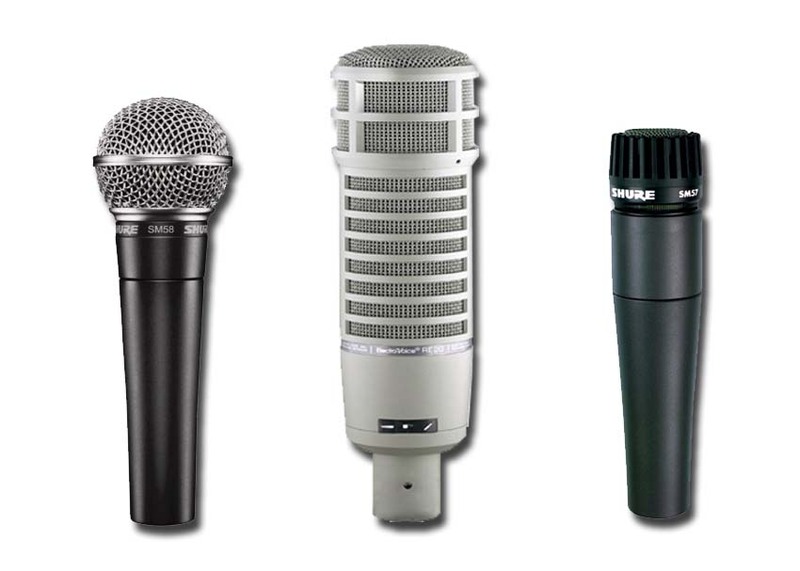 Microphones come in a few different forms: condenser, dynamic and ribbon to name a few. 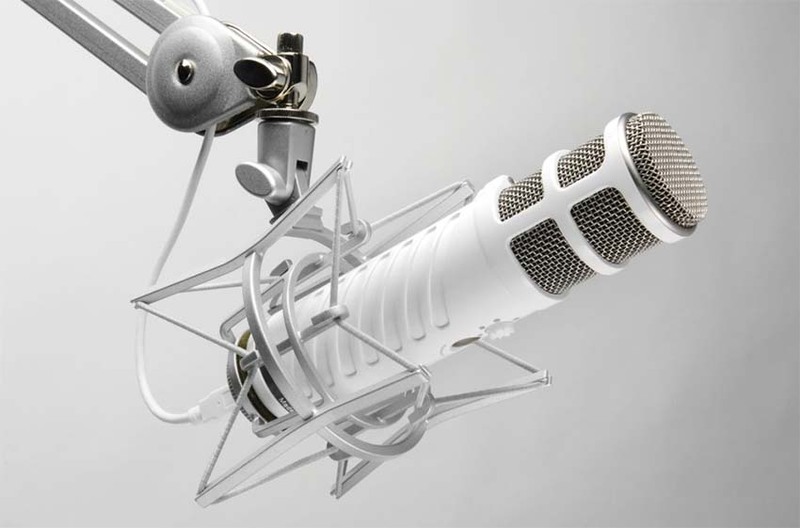 Dynamic microphones typically win out when it comes to broadcast-quality mics. This is due to their having less of a “proximity effect” that condenser microphones tend to have. Condenser microphones capture beautiful vocals across a wide frequency band, but this can include a lot of room noise on the high and low ends. When you’re recording a podcast that’s based on you talking, it’s best if your listeners hear you talking, and not the air vent turning on, or your keyboard clacking below. Some great broadcast microphones include the Shure SM-7B and Electro-Voice RE-20. Both are used at the highest levels of broadcast radio and television. More affordable options include an old industry workhorse, the Shure SM58, the Audix OM2 and, on the condenser side, the Audio-Technica AT2020. All of these microphones will get the point across and provide excellent sound quality. Beyond mics, an audio recording DAW is a necessity. If you are pre-recording your podcast, free programs like Audacity or Garage Band will do fine. More intuitive programs like ProTools, Ableton Live or Logic Pro bring your production to a higher and more skill-based level. Obviously you’ll need to be knowledgeable in any of these DAWs to make your recording sound great, so run a few sound tests, watch a few YouTube tutorials and you’ll be golden. Now, if you are livestreaming your podcast with video accompaniment to Twitch, YouTube or Facebook, a great software to use is Open Broadcast Software, or O.B.S. This is a free, open-source software that lets you livestream directly from your computer and even lets you save a recorded copy of the stream. This program is what most livestreamers use when it comes to Twitch or YouTube. There are limitations, but it’s free and when you’re live you have to make a few sacrifices. Test out your mic and DAW settings before recording the entire podcast. Set up your EQ, compression and equipment for the best results. 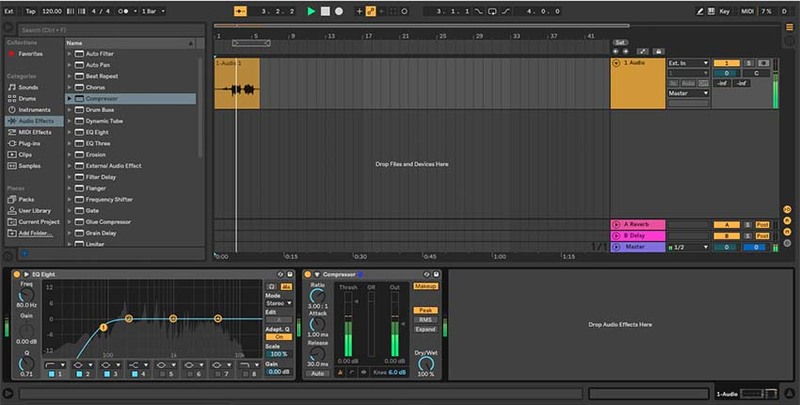 DAW pictured is Ableton Live 10. There are a ton of ways to market and distribute your podcast. The most popular way is through Apple iTunes (I mean, it’s a PODcast, named after the iPod after all.) iTunes doesn’t actually host your podcast though; this is done through a host website like SoundCloud or Buzzsprout where you setup an RSS feed. Once you’ve uploaded your first episode to the host site, you’ll submit your RSS feed to iTunes. You’ll need to find your RSS feed URL, so consult your host site’s FAQ if you’re not sure. You’ll also need an Apple ID and podcast artwork when submitting to Apple, then they will review your inquiry and see if you meet the Apple Podcasts requirements. This process takes anywhere from a few hours to a few days. Once you’re approved, go check out the Apple Podcasts app right away and marvel over your creation on a big directory just like I did! This process of submission and post is very similar on other directories like Google Play and Stitcher, so make sure to link your podcast there as well so you can cover as big a network as possible. A Rode Podcaster USB microphone. Now that all the hard work is done, it’s on to slinging your cast! The best marketing in content creation is consistency, if someone sees that you only make a podcast every 18 months, they are way less likely to subscribe than if you upload every week. Make sure you advertise your upload times on social media and even speak about it in your podcast. Early in each episode, after you’ve established the theme and important matters, you can create a “call to action” by mentioning ways to subscribe on each directory in which your podcast is live. It’s also important early on to mention Apple Podcast reviews which are the lifeblood of any popular podcast. The more engagement via reviews a certain podcast gets, the higher up the charts it goes in any given directory. The higher up the charts it goes the more listeners you’ll get. Then all that’s left to do is ride that sweet wave to brand deal land and have the most fun talking about something you love. Why Choose a Line Array Speaker System?